[W]hat he [Radovan Karadzic] meant was that when our army entered Srebrenica and when the Muslim army in Srebrenica was defeated, that they would start pulling out. And I concluded that he thought that we should kill everybody we could get our hands on. Q. So on this meeting of the 8th or 9th, did President Karadzic actually say, "Miroslav, they should be killed," referring to any potential Muslim prisoners? After the Glogova Massacre, Deronjic went to Pale (war-time Bosnian Serb capital) to meet Bosnian Serb leader Radovan Karadzic. When Deronjic walked in a large conference hall, Karadzic was sitting at a table with a map in front of him. With him were Bosnian Serb army commander-in-chief General Ratko Mladic and one of Karadzic's officials, Velibor Ostojic. Deronjic said that when he reported that the village of Glogova had been burnt down and its Bosniak population deported, the three men broke into applause. "Now we can colour Bratunac in blue," said Ostojic. Blue is a traditional Serb national colour. During the war, Deronjic was chief of the Bratunac crisis staff, an ad hoc Bosnian Serb local government, during the time when forces under his control attacked the Bosniak village of Glogova in May 1992. 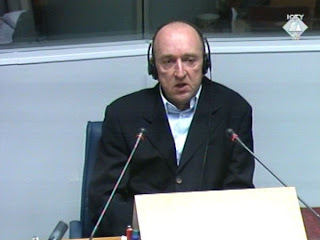 Deronjic was the only person to be convicted for Bratunac related crimes in which over 600 Bosniaks died. In a signed statement, which he gave to the International Crimes Tribunal, attached to his plea agreement was evidence implicating the Yugoslav army and Serbian police and paramilitaries in the massacre. In his statement, he said that, as a confidant of Karadzic and a central board member of the latter's Serbian Democratic Party, he was aware that in the months leading up to the war both the Yugoslav army and Serbia's interior ministry were arming Bosnian Serbs. In mid-April 1992, volunteers from Serbia poured into the town of Bratunac, on the river Drina. They came under an agreement between the leaders of the Bosnian Serbs and Serbia itself, said Deronjic. The volunteers immediately killed some of the most prominent Bosniaks. 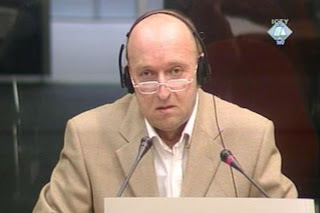 Deronjic, who was 52, had been convicted of ordering an attack on a Bosnian village Glogova in 1992 which resulted in a massacre of 64 Bosniaks. 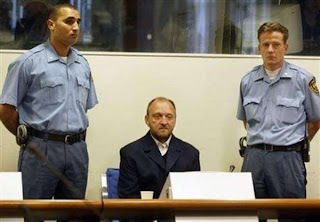 The war crimes tribunal in The Hague sentenced him in 2004 and rejected an appeal the following year after which he was moved to Sweden to serve his sentence. "He died from natural causes last night in a hospital in Sweden," said Christer Isaksson, head of security at the Swedish Prison and Probation Service. Isaksson gave no more details about the circumstances or place of Deronjic's death. Deronjic was a prominent member of the Serb Democratic Party (SDS) in the Bratunac region of eastern Bosnia (just outside Srebrenica) during the 1992-95 conflict. He was sentenced in March 2004 after pleading guilty to persecution, a crime against humanity, the previous year. Yugoslav army and Bosnian Serb forces razed the village of Glogova to the ground, setting alight its mosque, homes, warehouses, fields and haystacks in May, 1992. Sweden signed a 1999 agreement with the UN tribunal to offer prison space for convicted war criminals. Former Bosnian Serb president Biljana Plavsic is serving an 11-year jail term for crimes against humanity in a Swedish prison. 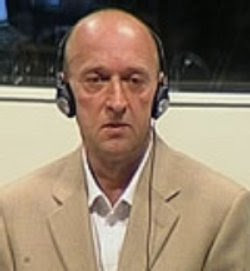 Plavsic was convicted in 2003 by the UN War Crimes Tribunal. "I would prefer completely to cleanse eastern Bosnia of Muslims. When I say cleanse, I don't want anyone to take me literally and think I mean ethnic cleansing. But they've attached this label 'ethnic cleansing' to a perfectly natural phenomenon and characterized it as some kind of war crime." As a professor of Biology, Plavsic promoted her big scientific discovery by claiming that Bosniaks were "genetically deformed." According to her interview, her dream heroes were mass killers such was paramilitary leader Arkan who participated in the Eastern Bosnia massacres and ethnic cleansings. [more on Biljana Plavsic 'science'...]. Slobodan Milosevic, who was on trial at The Hague for 66 counts of genocide and war crimes, also died in prison last year in the 5th year of his trial. 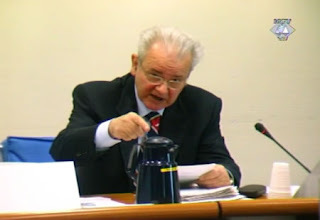 Milosevic's death prevented a final judgment in his case. In a recent mass burial of Bosniak victims in Bratunac, Bosnian Serb residents were unwilling to comment. 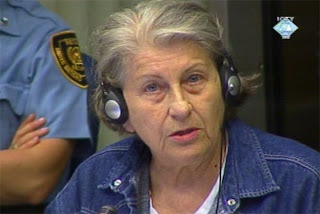 Only Dragica Todorovic, a 50 year-old Serb woman was willing to speak about the burial site. Todorovic said she was sorry that part of a field she had used as a garden was now turned into a cemetery. "I'm only sad about my potatoes. I will ask the municipality to reimburse my loss," she said. LIFE IN HELL, ENCLAVE OF "SAFE HAVEN"